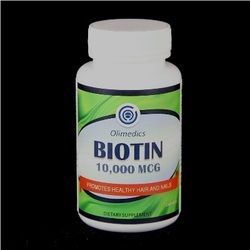 Biotin is necessary for cell growth, the production of fatty acids, and the metabolism of fats and amino acids. Biotin assists in various metabolic reactions involving the transfer of carbon dioxide. It may also be helpful in maintaining a steady blood sugar level. A number of metabolic disorders exist in which an individual's metabolism of biotin is abnormal, such as deficiency in the holocarboxylase synthetase enzyme which covalently links biotin onto the carboxylase, where the biotin acts as a cofactor. High doses of biotin may play a role in stopping and reversing progression in progressive multiple sclerosis. Biotin deficiency can arise due to various inborn genetic errors that affect the activity of biotin-related enzymes. Since endogenous biotin production occurs in the gut, dysbiosis could also upset the metabolic processes that allow the body to generate biotin on its own. Deficiency symptoms include: hair loss (alopecia), conjunctivitis, dermatitis in the form of a scaly, red rash around the eyes, nose, mouth, and genital area. Neurological symptoms in adults, such as depression, lethargy, hallucination, and numbness and tingling of the extremities. Tale 1 capsule orally daily preferably with a meal or as directed by a healthcare professional. This product is manufactured and packaged in a facility which may also process milk, soy, wheat, egg, peanuts, tree nuts, fish and crustacean shellfish. KEEP OUT OF THE REACH OF CHILDREN. STORE IN A COOL, DRY PLACE. Other ingredients: Rice powder, microcrystalline cellulose, hydroxpropyl methylcellulose, vegetable magnesium stearate and silicon dioxide.